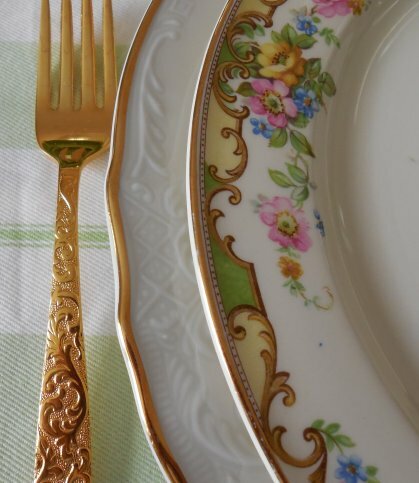 If you have a thing for vintage dinnerware like I do, you know exactly what I mean when I say the last thing I need is more dishes. But you also know what I mean when I say there’s no such thing as too many dishes! So that’s essentially the battle taking place in my mind whenever I come upon a stack of, say, twelve pretty somethings marked $3.99 at Goodwill. 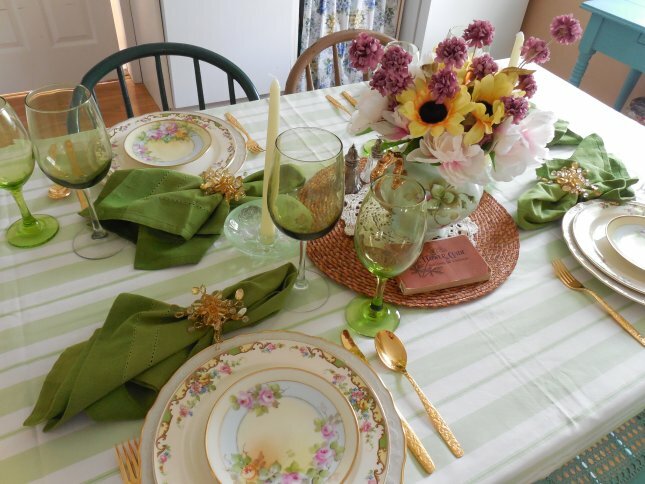 What’s a tablescape-loving girl to do? 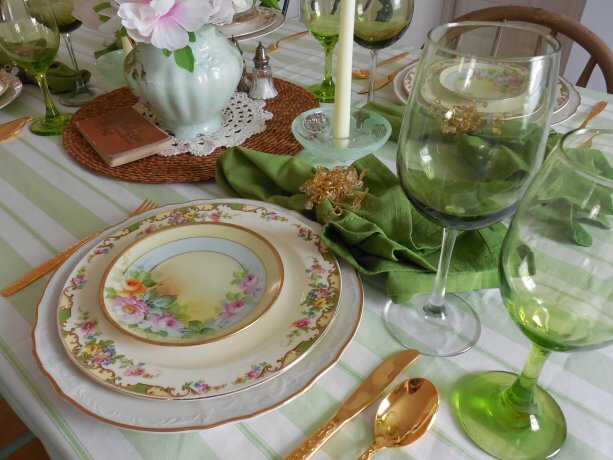 If you said, “buy the dishes,” you are invited to lunch at my pretty “Summer Garden” tablescape! 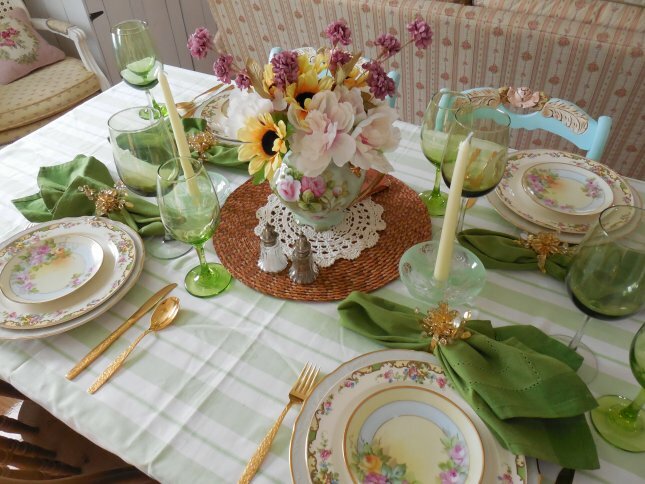 I knew it had been awhile since I had set and posted a pretty table – but I didn’t realize until I looked it up that it was actually in April! I was still hobbling around on my broken foot at that point! 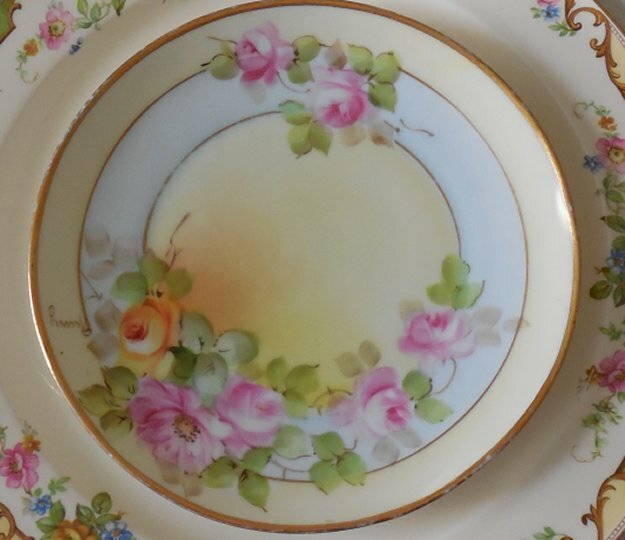 The smallest plate is hand-painted Bavarian china by Heinrich & Company. I found just a few of these about a week ago for 99 cents each, then over the weekend I found quite a few more. 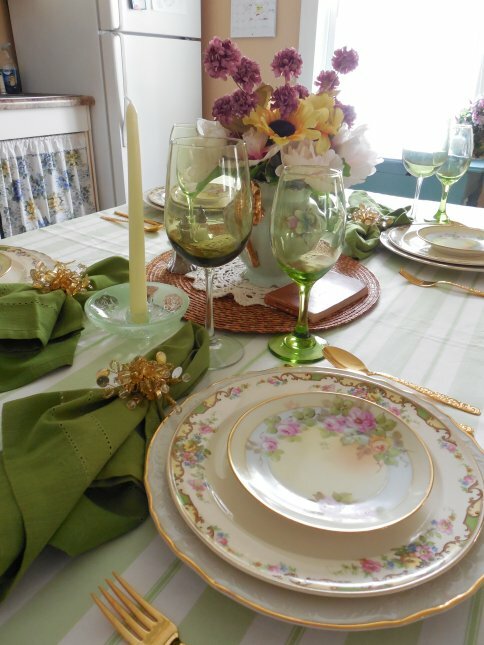 Same price, same maker and pattern, but a different Goodwill store! 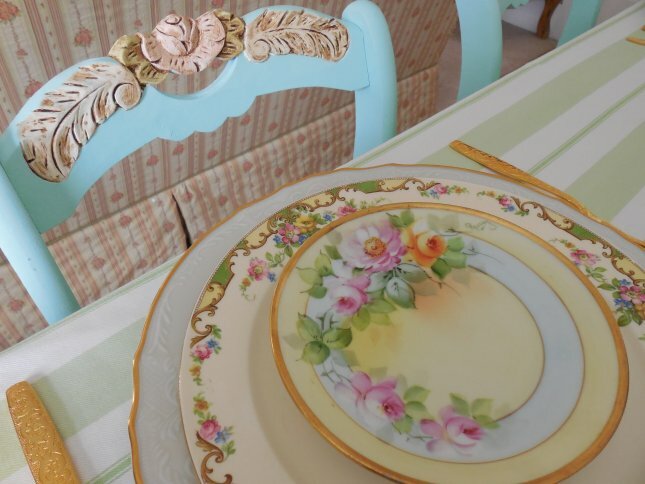 Because these are hand-painted, each one is just a little bit different. 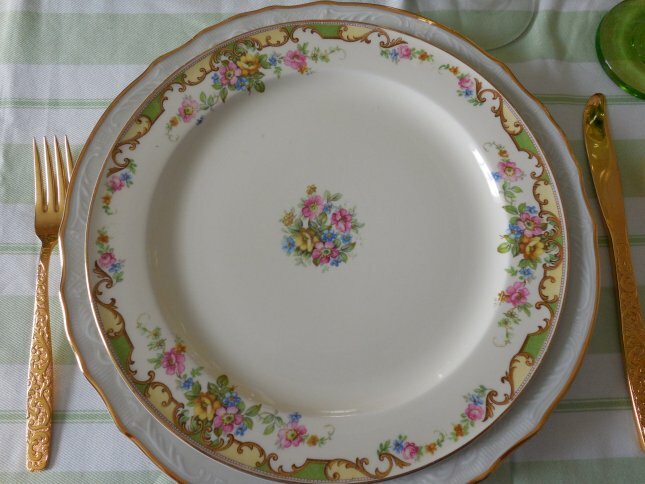 And our luncheon plate is by Baum Brothers. 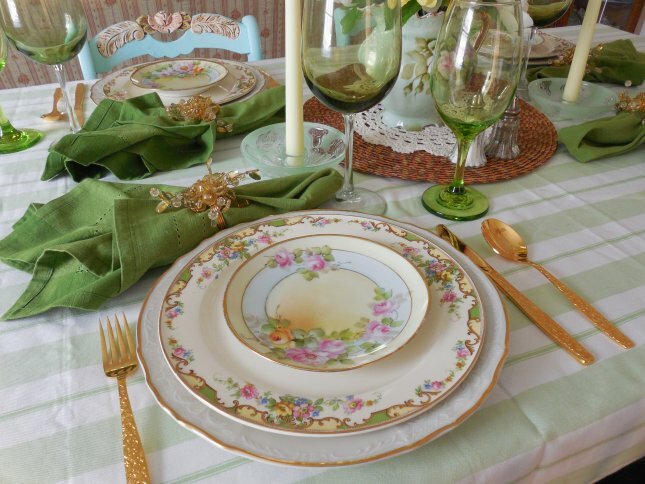 The series is called “Formalities” and the pattern is Bernadotte. 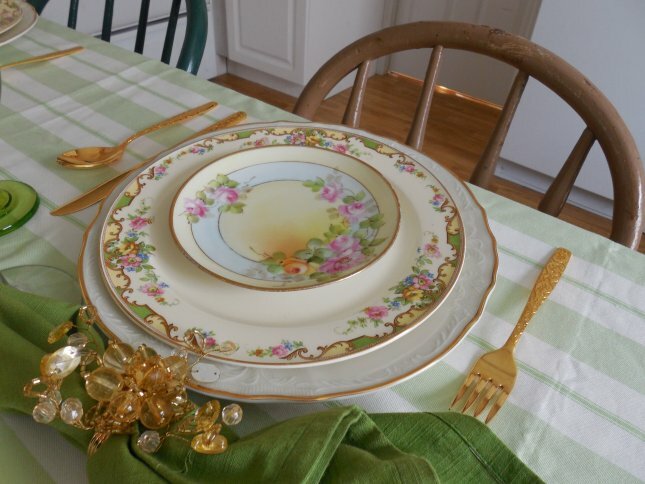 Vintage dinnerware often has that pretty gold rim – and I wanted more than a little bit of gold on this table to represent that summer sun! 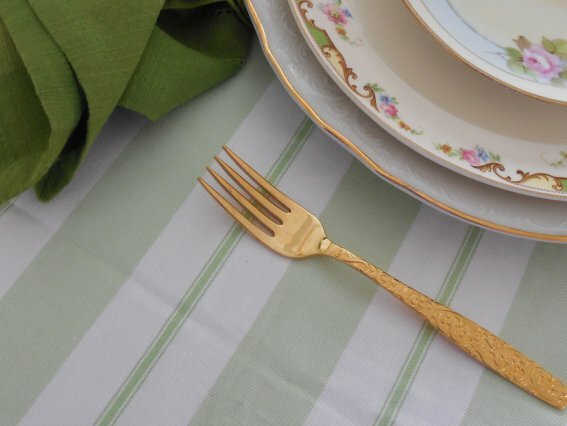 So I’m using my American Golden Heritage flatware set by International Silver. 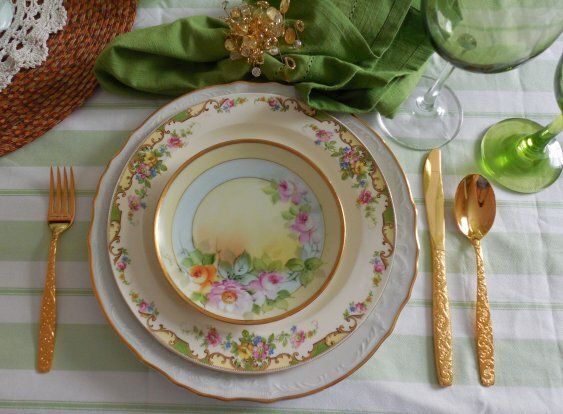 I first used this set for my Golden Glow of Christmas table last December. 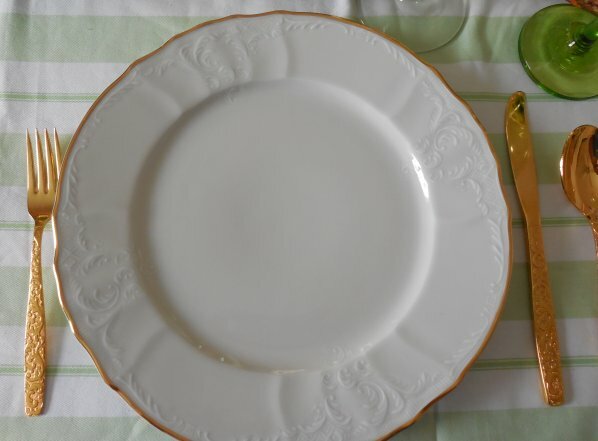 It was an antique store find, service for four plus a few serving pieces at just $12. 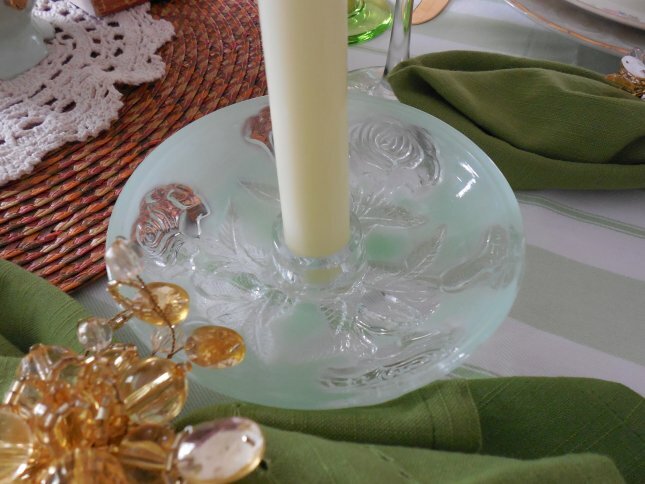 Our tablecloth is a beautiful lined drapery panel by Pottery Barn Kids, in a soft green and white stripe. This was also a Goodwill find. 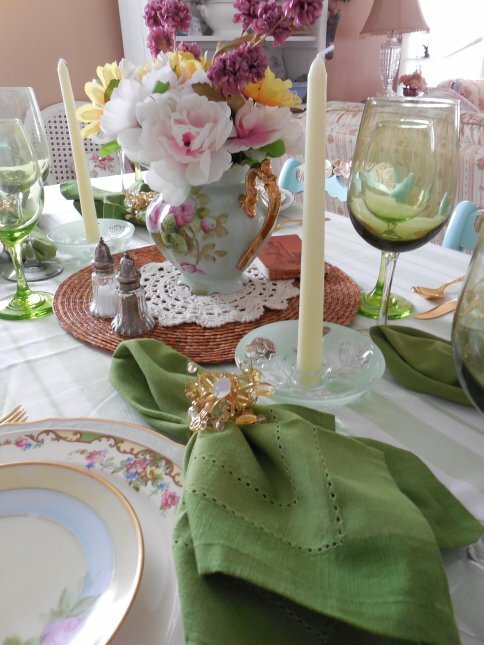 The taper holders were thrift-store finds in the softest green with sculpted roses, and our napkins are in a deep botanical green by Pier 1. 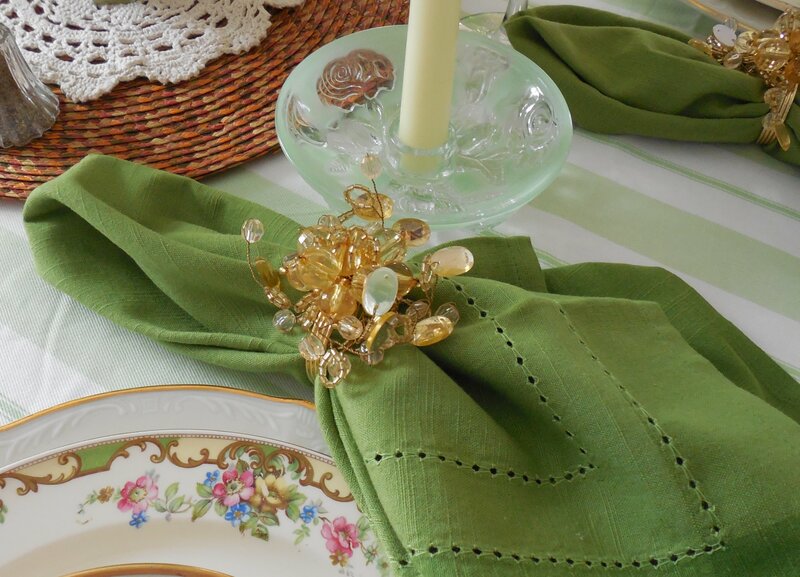 I believe the gold napkin rings (there’s more of that summer sparkle!) are also by Pier 1. 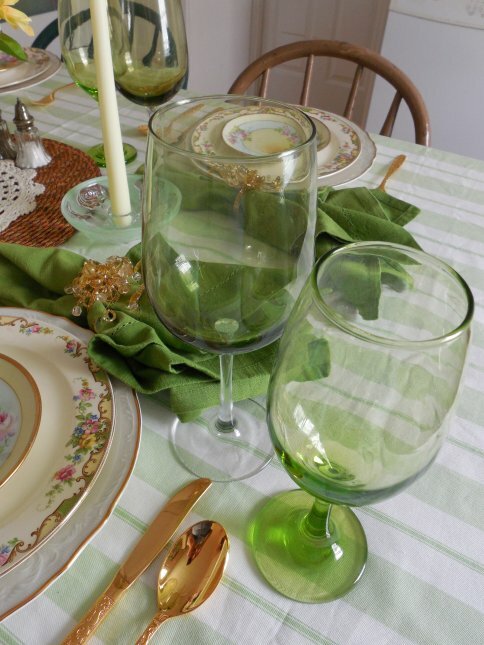 Glassware is all from Dollar Tree – they have so many lovely colors in stemware, but availability varies by location. These are two different shades of green, but the short brighter one seems to tone down a bit sitting next to the taller one. 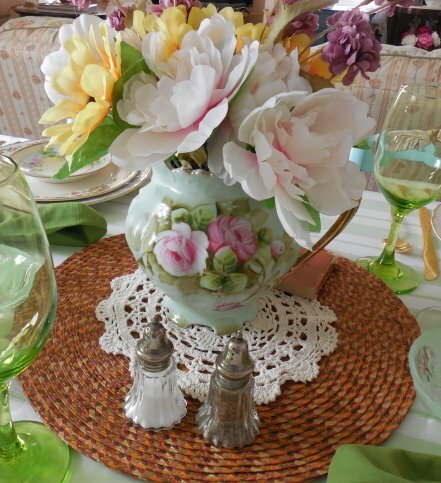 The centerpiece is a beautiful handpainted Lefton pitcher I’ve used as a vase. 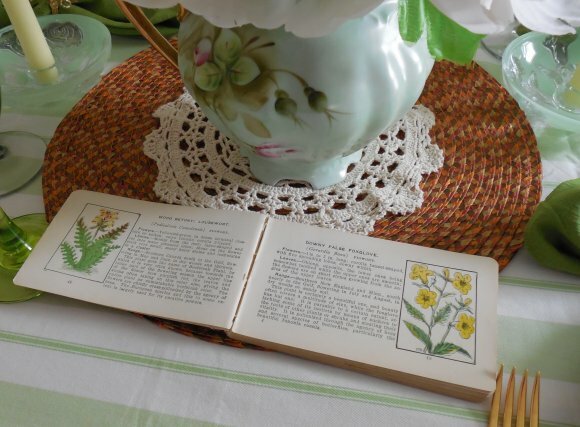 I’ve simply set the salt and pepper shakers on one side, but on the other… I placed a bit of summer reading material: my antique field guide to wildflowers, which belonged to my great-aunt. You are welcome to pick up the field guide and take a look – it’s organized by flower color! 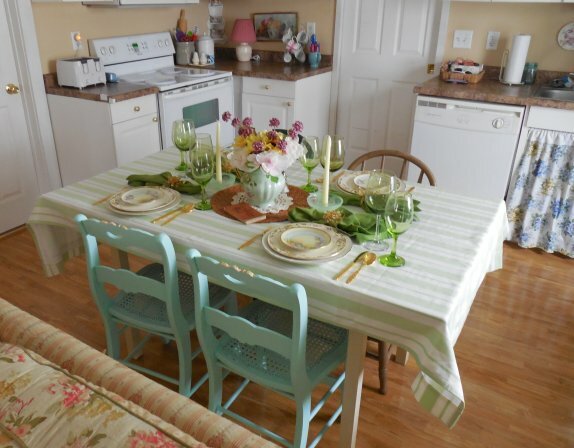 … and my casual painted cottage kitchen chairs (remember Elinor?). 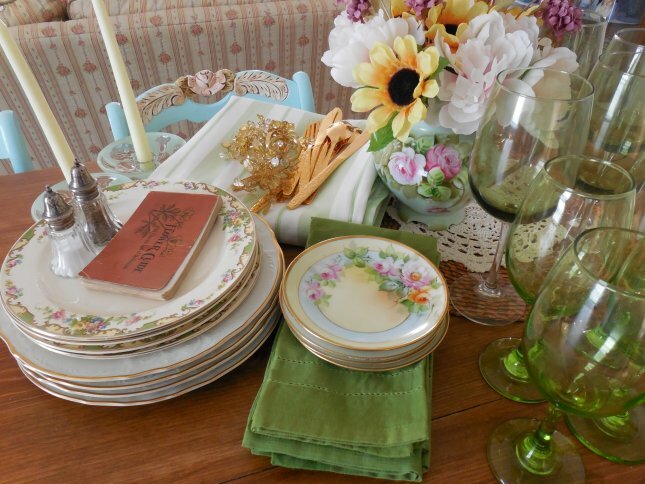 And by now you know that one of my favorite pictures of any tablescape is the “put-away shot.” This is where everything is just gathered together, waiting to go back into the cupboards! 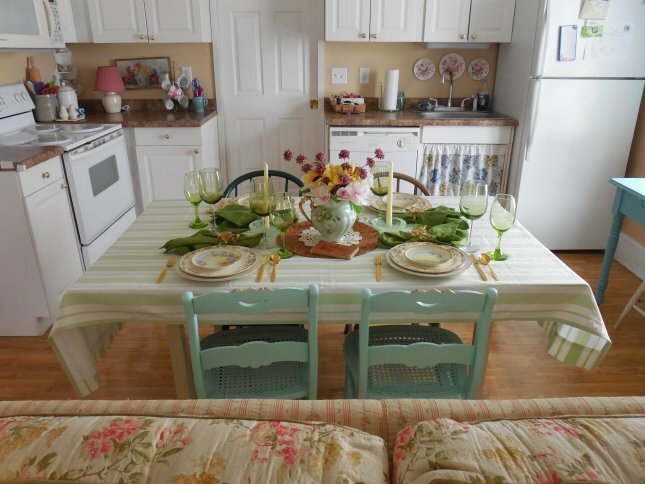 Are you ready to go sit on the patio with a glass of lemonade? We can watch the Eastern Goldfinches and the hummingbirds enjoy their treats! Plus, the sunflowers are just about to burst open! Here’s an image to Pin if you would like! 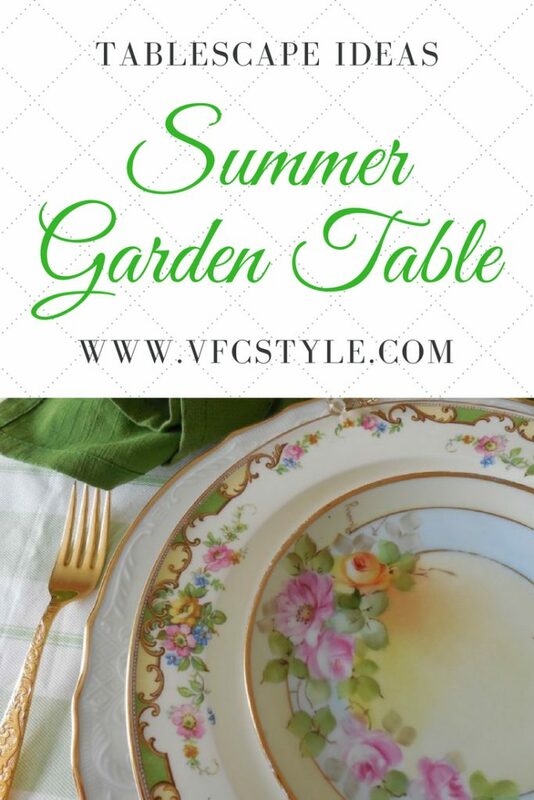 I’m sharing my Vintage Dinnerware Summer Garden Tablescape for Tablescape Thursday over at Between Naps on the Porch! I’m also linking to Dishing It and Digging it at Rustic & Refined. 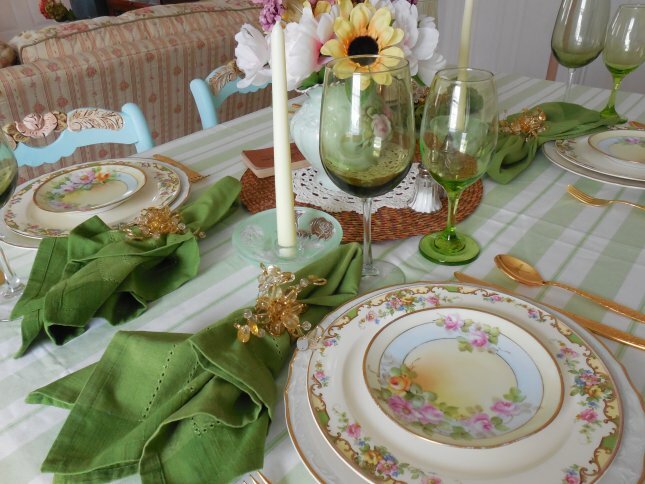 Be sure to visit these wonderful blogs for much more table inspiration! 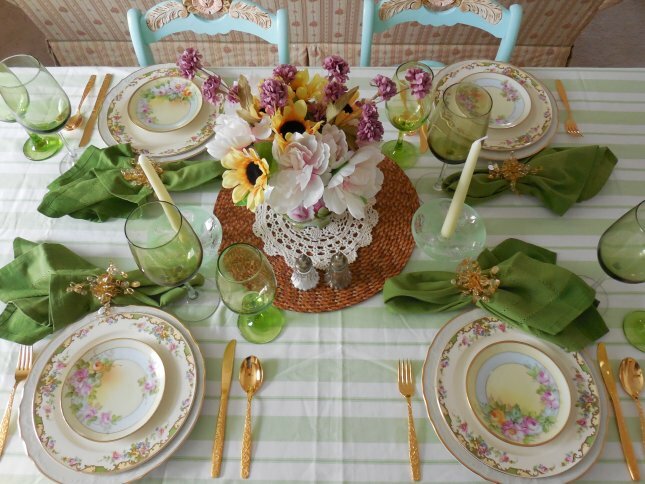 This tablescape is absolutely gorgeous! 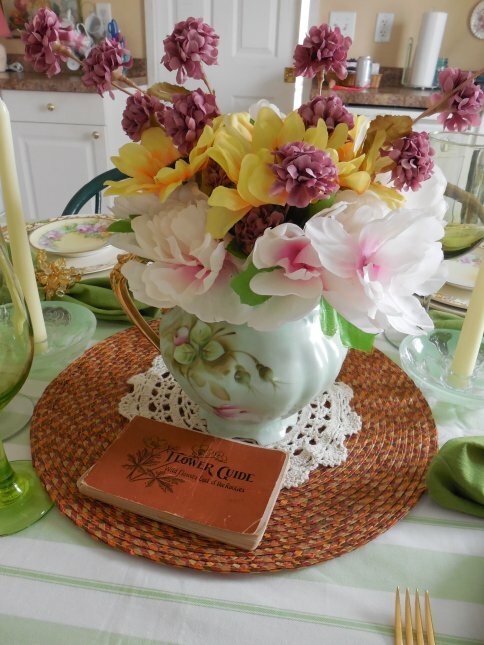 Love how you pulled it all together from vintage to dollar tree items Janet! Thank you so much, Lisa, I had a lot of fun creating this one! 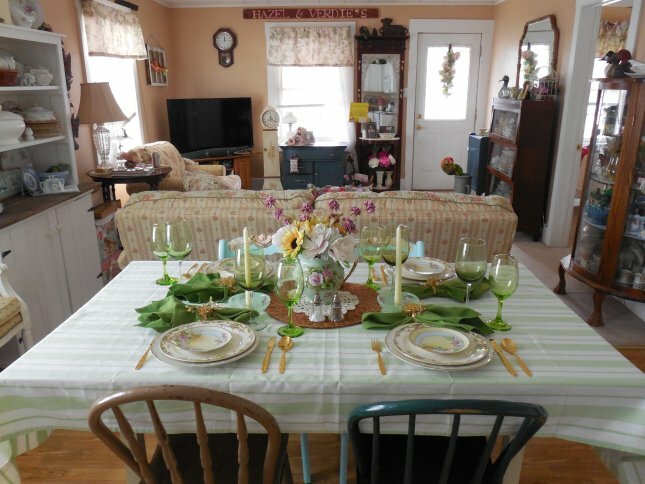 THanks, Debby – so glad you like it… it sure was a pretty sight when it was all set up! Very pretty! 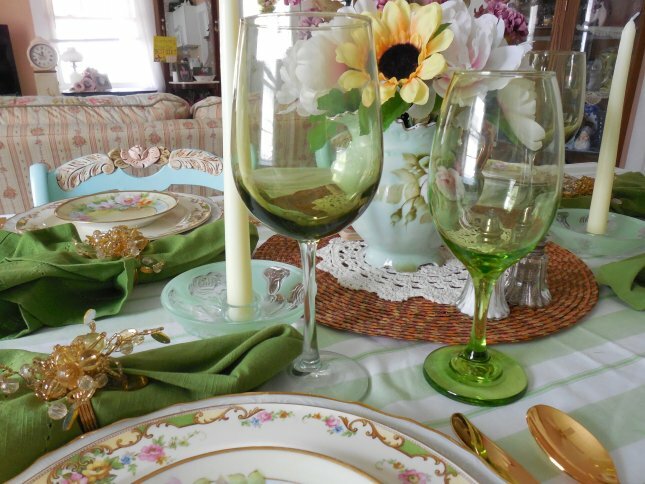 Everything is so bright and cheerful! Hi Stephanie, thank you for stopping by! Glad you like it! 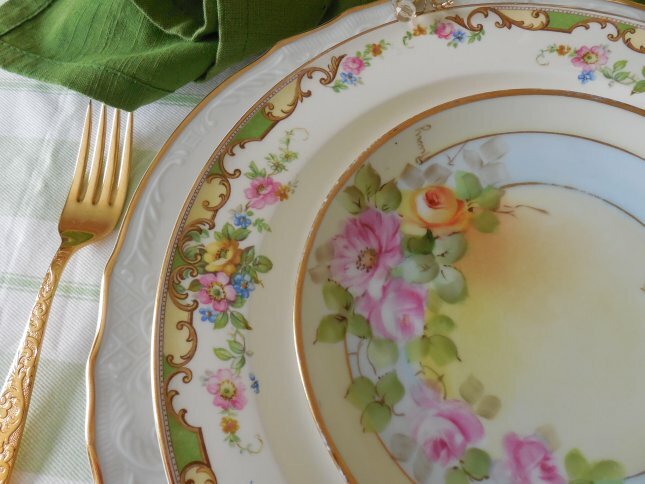 Such a gorgeous table and beautiful pattern on your dishes. I love how romantic they feel! 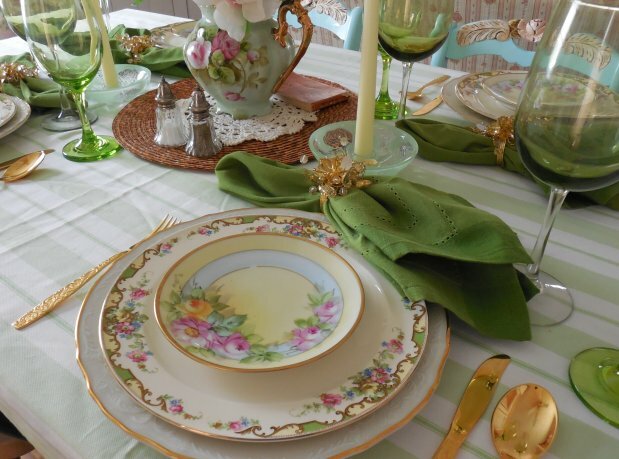 What an absolutely beautiful table setting! I cannot believe the wonderful deal you found in those dishes. Such a gift! Thanks Laura, yes it truly was a gift… there is one that has a pretty large chip in it, so technically I could only have 11 people for lunch – LOL. Thank you for stopping by!